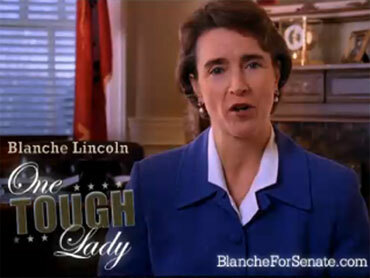 Hitting the airwaves in Arkansas for the first time in her bid for re-election, Democratic Sen. Blanche Lincoln declared that Washington is broken. "I want to show you what it's like in Washington these days," the one-term Democrat says to start off the ad saying. The visual: children fighting each other with foam bats. Those same kids are then seen throwing money around the room, which Lincoln says is "your tax dollars." She says she voted against "giving more money to Wall Street, against the auto company bailout plan, against the public option health care plan and against the cap and trade bill," which she says would have raised energy costs for Arkansans. Lincoln says proudly that some in her party were not happy about her votes, but as the words "one tough lady" were emblazoned on the screen, she declares: "I approve this message because I don't answer to my party, I answer to Arkansas." See the Lincoln ad here. 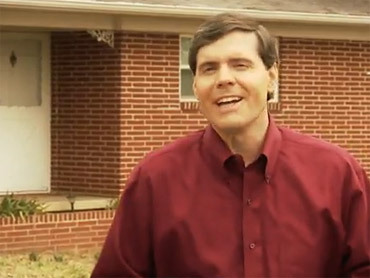 The ad comes the same week that Arkansas Lt. Gov Bill Halter has declared his candidacy for the seat, challenging the incumbent Lincoln for the Democratic nomination in the May primary. Halter's message: "The reason I'm running is pretty simple: Washington is no longer on the side of Arkansas families. And it's up to us to fix it." Halter also a new ad produced, where he says he's running to "take on the Washington special interests" and using his record of success at the state wide to show he can "get it done" as his old high school football coach says in the ad. See the Halter ad here. Halter's entrance into the race has definitely put additional pressure on Lincoln, who was facing a difficult environment for re-election even without a primary challenge. The Democratic Senatorial Campaign Committee has come out behind Lincoln (as she is a sitting senator) but many liberal groups have come out against her. The progressive group MoveOn.org has spearheaded an effort to raise over $1 million for Halter and sent an e-mail to its members calling Lincoln "one of the worst Democrats in Congress" -- trying to rally support to take on the Democrat establishment who supports her. "So we need to send a clear message that if they start raising more money and running ads for Lincoln, they're going to outrage grassroots Democrats around the country," the email says. Asked about the race at the White House today, Press Secretary Robert Gibbs said "The president supports senator Lincoln, who is an incumbent member of the Senate." Gibbs said that the president, as head of the Democratic Party, understands that "not every democrat is going to agree with him on every issue," but that "Senator Lincoln is serving her state well and he believes she should be returned for an additional term." So Arkansas is quickly becoming another example where a Democrat, running for re-election is caught between the growing anger against Washington from a wide range of voters, not just the middle, and criticism that she's not been liberal enough, from the left. Robert Hendin is a CBS News White House producer. You can read more of his posts in Hotsheet here.